This article will tell how to increase the size of system partition when Windows Server 2012 says it runs out of disk space. Download IM-Magic Partition Resizer Server to fix low disk space on Windows Server 2012 when there is low disk space. When you receive low disk space warning on system partition on Windows Server 2012, you can use IM-Magic Partition Resizer Server to redistribute hard disk. IM-Magic Partition Resizer Server is a professional partition tool which can work on all Windows Servers to help resize hard disk so that you can increase the size of system partition when system says the partition is running out of disk space. This partition software enables you to extend system partition on Windows Server 2012 and Windows Server 2012 R2 without reinstalling system or rebooting PC. Download, install and launch IM-Magic Partition Resizer Server. 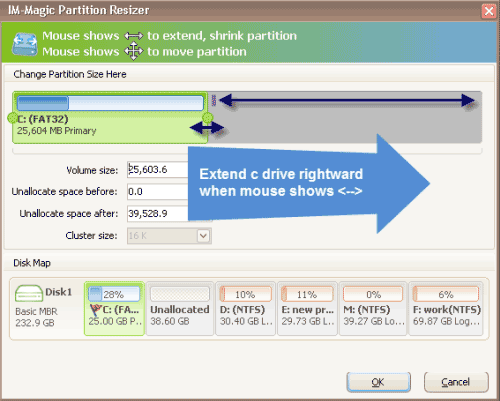 Right click a partition that has enough free space and select "Resize/Move" option. You need to move the unallocated space close to system partition. Then, right click the system partition and choose "Resize/Move" option. Move the arrows to add the unallocated space to the system partition and then click "Apply" button. "Today, when I boot my PC, system says that C drive (system partition) is running out of disk space. My PC runs under Windows Server 2012 operating system. 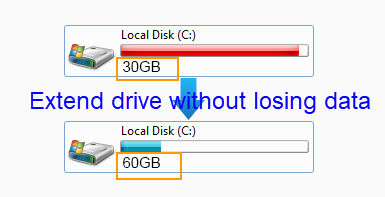 Please tell me how to fix the low disk space problem on system partition on Windows Server 2012. The hard disk on my PC is Western Digital hard disk. Thanks for any kind help!" "I need to resize hard disk on Windows Server 2012 because it reports low disk space alert on system partition, but I do not want to repartition hard disk because the disk partitions contain lots of important data. I am wondering if I can resize hard disk without repartitioning hard disk or touching any data on the hard disk. Can somebody tell me how to fix low disk space on Windows 2012 system partition without losing data?" Instead of repartitioning hard disk or deleting files, you can resize hard disk by using professional partition software. IM-Magic Partition Resizer Server allows you to move free space from another partition to extend the size of system partition. You can only move free space on the same hard disk. This partition software helps you resize hard disk by moving free space from one partition to another so that you have no need to repartition hard disk or free up disk space to fix the low disk space problem on system partition. This partition software works on FAT32 and NTFS partition to reallocate disk space without rebooting your PC. System partition runs out of disk space on Windows Server 2012 R2? IM-Magic Partition works on Windows Server 2012 R2 perfectly to resize hard disk to resolve low disk space issue on system partition. By using this partition software, you can extend system partition space on Windows Server with operating system or disk data untouched. This partition software provides an easy and safe method to resize hard disk, so you can completely rely on this software when you need to fix low disk space problem. When you meet low disk space problem on any of partitions on Windows Server, you can always use the partition software to reallocate disk space.